Polarimeters are analytical hardware components for measuring the polarization of light and analyzing the optical activity of chemical substances. Optical activity refers to the capability of a material to rotate beams of polarized light and the degree to which such phenomena occurs. Manipulating the polarization of light through prisms or optical filters has been a common practice for over 200 years, and these established principles are still largely applied in modern polarimeters. The instrumentation commonly comprises an incident light source that is directed through a polarizing prism, which transmits light waves that only fluctuate across a single plane. These polarized beams pass through a sample tube, which can be loaded with an array of chemical solutions, before reaching a second prism. By observing light transmitted through this analyzing prism, an observer can determine if the sample has indeed rotated the light from the polarity predetermined by the initial prism. Polarimeters can be used for a range of research and academic studies, having already proved instrumental in the historical understanding of isomer arrangements and to measure concentration levels of solid solutions such as glucose. Modern polarimeters are used in academic environments to display optical activity to students in practice, with emphasis on teaching stereochemistry modules. Optical rotation was first observed using quartz materials, but understanding the optical properties of crystalline structures rapidly led to greater understandings of biological isomers and sugar concentrations in samples. This knowledge improved our understanding of three-dimensional molecular structures. Such polarimeters do not require the stringent levels of accuracy required for industrial chemistry applications. These are primarily concerned with longevity through robust materials and sturdy designs to ensure ease-of-use for inexperienced observers. 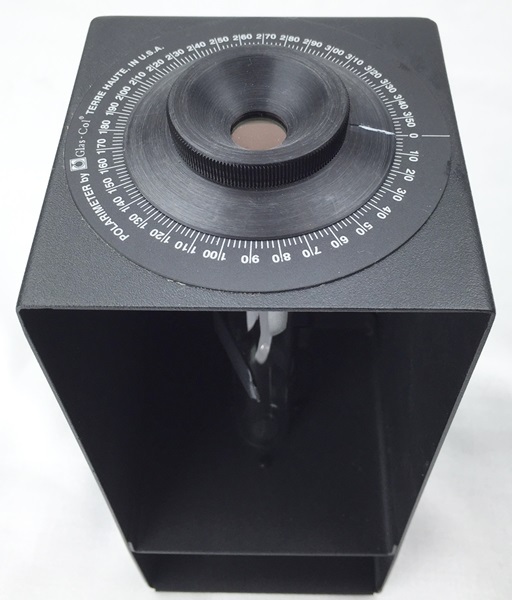 The Glas-Col polarimeter was designed with such applications in mind, featuring an inexpensive incandescent light and an array capable of providing a precision of 1°. This equipment can be used to qualitatively observe optical rotation in classroom conditions, simply by manually aligning the filters to minimize the amount of light transmitted to an observer – before loading the sample chamber with a sugar solution and directly observing the optical rotation. This equipment is also prepared to perform quantitative analysis of optical activity for isomers and stereoisomers in varying solutions. Glas-Col is a leading supplier of laboratory equipment for a broad range of academic, industrial, and research applications. We provide a robust selection of instrumentation for specific processes or experiments, including dedicated vertical polarimeters with both front and side-lighting components. If you would like any more information about our polarimeters or any other products, please do not hesitate to contact us.